As fate and weather go hand in hand, Monday morning breaks clear, sunny and warm after a weekend of heavy constant rains. The numbers are in from the attendance at the Mardi Gras Parade and they are disappointing. Rough estimates put the crowd at about 300,000. This is down from years past and entirely due to the weather. The locals stayed away so it was up to us crazy foreigners to do all the cheering and whooping. 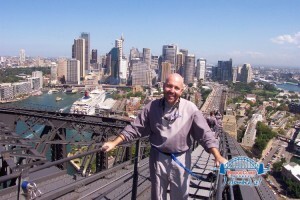 We are scheduled to do the BridgeClimb adventure today which takes us to the top of the Sydney Harbour Bridge about 134 meters above sea level. We have seen the climbers scaling the bridge several times during our trips to the harbour and today is our day to conquer the bridge. Grant Wedge has decided to join us and we meet about 11:30 at Circular Quay to make our way up to the bridge for our pre-reserved 11:50 check in. We are in the “12:05” climb and have been told we will be at the Bridge for 3.5 hours in total. We arrive to a very organized production line. We are quickly divided into our “team” and watch a quick video on the process. We are then ushered into our debriefing room, sign our waivers and do our breathalyser test (Yup!). 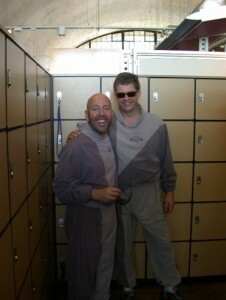 We then move to the dressing rooms and are given grey polyester one piece suits to wear on the bridge. Not very flattering but then everyone looks the same, thank God! For liability issues, we cannot bring anything up on the Bridge with us—no cameras, wallets, watches, loose change etc. They want nothing to fall in to the traffic lanes of the bridge. Our sunglasses are fine but are attached, as are our baseball caps and pretty well everything else, to our suits by clipping them on our backs. Our Fearless Guide: Big Pete We meet our diverse team, young and old alike, and watch as the two or three teams ahead of us go through their paces before disappearing out the door and up the Bridge. Our team leader, who will also be our guide for the climb, is Big Pete. Pete is true Aussie and a big guy (hence the name) and is jovial and full of knowledge. 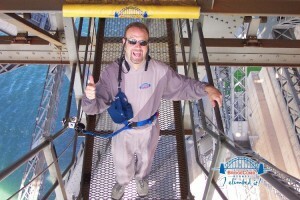 Next up is our safety harness that attaches us to the walking line and the bridge for the entire trip. This is an ingenious piece of simple design that allows us to squeeze through some cramped areas and around some tight corners while still being safe and attached. Our final gear up is our headsets and radios so that we can follow Big Pete’s scintillating commentary throughout the process. There is a simulator on site and they make us climb the ladders with our gear before we get on the bridge. Note: The simulator doesn’t even come close to the ladder climb we will do! We receive our final debrief and off we go! Everyone was told to strip down to our underwear under our suits today for the climb because of the sun and we are glad for it. As some of you may be aware, polyester doesn’t breathe that well and walking ten feet, we break sweat. The first part of the climb is getting to the pylon that will take us to the eastern arch. This is a very open walk and is a good warm up for what is to come. We are under the bridge right now on suspended catwalks and this is where, we discover, the waterfall effect fireworks on the bridge are let off. We continue across and over and get to our first ladder up. We must scale four 10-foot ladders. This is done alone as the climb rules state that only one person can be on a ladder at any time. Each ladder takes you up, up, up until you reach the top of the pylon, and there you are, at the bottom of the top arch of the bridge. We are already quite high at this point and it is a beautiful afternoon with a lovely sea breeze blowing in from the North East to keep our “polyester” cool and comfortable. And we start up the arch. It is a very easy climb, the metal stairs spaced quite comfortably. We are heading north up, up, up the eastern arch and the views of the harbour and environs are spectacular. Big Pete has stopped us several times to take photos, which they try and sell to you at the end of the climb, and we stop at the top on the middle span and survey the world. We have now crossed over and are heading back down the Western Arch with views over the western harbours out to the Olympic site and the Anzac Bridge. It is interesting to see Sydney’s’ extensive harbour from up here. We get to the bottom of the Arch and have to deal with those ladders again – this time going down. Far below us is the commuter train that goes from Circular Quay to the north shore and I can hear and feel it rumble beneath me as I head down the ladder. This is the only difficult part of the climb for me. One more photo opportunity from Big Pete and it is just the final walk home and the de-gear. It has been a more strenuous walk than we had imagined and we are thirsty and hungry for a late lunch. We end up at one of the local pub/ale house/hotels around the corner and give ourselves a congratulatory “cheers” for our hard work.